Since we do it about 23,000 times a day, focusing on the breathe every so often throughout the day is not such a difficult task. And since “All chronic pain, suffering, and disease are caused by a lack of oxygen at the cell level” (Dr Authur C Guyton – Textbook of Medical Physiology 1956), then its not difficult to conclude that addressing dysfunction breathing is essential to our health and fitness. Breathing is an oft-neglected aspect of fitness training programmes but it is essential that we learn to breathe efficiently to get the full benefits of training. In fact we can actually be damaging our health if we are not breathing correctly. Here are three simple breathing practices you can incorporate into everyday life and also take take forward into your training programme. It’s quite logical really. Breathe the amount of air required for your metabolic needs. For example if when sitting you took a number big, deep breaths, after a short while you would be breathing too much air for what your body is doing at that moment in time. Just as you can over-eat and drink too much you can also over-breathe. You do however want to be breathing deeply to activate the diaphragm, the dome-shaped muscle that divides the thoracic and abdominal cavities. Breath guru Dr Belisa Vranich suggests to visualise breathing in horizontally across the base of the ribs rather than vertically up through the chest. Practice: Sit towards the front edge of a chair with feet on the floor and a tall spine. Start by deliberately over-breathing to active the diaphragm, taking in a big breath and driving the air deep into the lungs. Visualise breathing horizontally across the base of the ribs. Keep the belly relaxed and notice it expand as you inhale. As you exhale pull the belly in with the intention of actively expelling the air. Do this a couple of times then settle into soft, easy, relaxed, rhythmical, breathing. Focus now on the effortless expansion of the belly and lower ribs as you breathe in and allow the exhale to happen as a natural release through elastic recoil. In a resting posture breathing out requires no effort from your body unless you have a lung disease. However when you’re physically active, your abdominal muscles contract and push your diaphragm against your lungs even more than usual. This pushes air out of your lungs. When you have establish a sense of calm, relaxed breathing, you can take this exercise a step further. As you follow your breath notice how little air you actually need for what your body is doing at this moment in time. Now, keeping relaxed, see if can can create a sense of light air hunger by breathing a little less air. The Oxygen Advantage Breathing method, devised by Patrick McKeown, addresses the common tendency to over-breathe, often due to mental overload and stress. This exercise is a great way of helping to re-set the brain to bring breathing volume back to a more ‘normal’ level of between four and six litres of air per minute in a resting posture. Researchers in Sweden found that the majority of patients with chronic stress and resultant exhaustion also have disturbed breathing patterns including the habit of over-breathing. The severity of their poor breathing habits were also related to their depression, anxiety, sleep disturbances and quality of life. Practice: Walking at an easy pace, keep the lips lightly together and breathe softly in and out through the nose. If you struggle with this, slow the pace or stop and rest for a short while. Then, hardly increasing the breath-rate, keeping your mouth closed, break into a very easy-paced run taking quick, light strides. If you feel you need to open the mouth, slow the pace or go back into and easy walk. The same applies for any endurance training at the gym. ie many reps (12-20), comfortable weights, steady rhythm. In 1995 Morton, King, Papalia wrote in the Australian Journal of Science and Medicine in Sport. “While breathing through the nose only, all subjects could attain a work intensity great enough to produce an aerobic training effect (based on heart rate and percentage of VO2 max)” For less-than maximum intensity training, and at all other times, nasal breathing should be employed. However mouth breathing can and should be combined with nasal breathing when training at higher intensity. Competitive athletes may spend 80% of their training with the mouth closed (80/20 rule). Our body loves on the rhythm. It promotes a sense of ‘being in the zone’, creating focus and energy. Breathing rhythmically has numerous health benefits since it helps to create coherent heart rate variability. If a doctor takes your pulse they will measure your heart beat over a certain period of time and perhaps the result is 70 beats per minute. However there are moment-to-moment variations in our heart beat that are not normally considered when average heart rate is measured. This naturally occurring beat-to-beat variation in heart rate is called heart rate variability (HRV). “Coherent HRV is experienced as a calm, balanced, yet energised and responsive state that is conducive to everyday functioning and interaction, including the performance of tasks requiring mental acuity, focus, problem-solving, and decision-making, as well as physical activity and coordination.” https://www.heartmath.com/science/ Emotional stress – such as anger, frustration, and anxiety – creates an irregular and erratic rhythm. Whereas positive emotions create a coherent heart rhythm pattern, helping body’s systems synchronise and work with increased efficiency and harmony. Emotional stress and mental overload all play a part in activating our body’s natural ‘fight or flight’ response. All too often we are spending time with our body preparing for danger and not enough time in ‘rest, recovery and restore’ mode. Since breathing patterns modulate the heart’s rhythm, it is possible to create a coherent HRV simply by breathing rhythmically. Therefore smooth, rhythmical breath, regardless of what activity you are doing – resting, working, exercising, has many health benefits. Practice: As with the exercise above start off nasal breathing as you walk and then take it into the easy run. Keep a constant cadence (strides per minutes) of between 170-180bpm. This constant cadence sets a rhythm into which the breath can settle. Find you own comfortable breath count. ie the number of steps per inhale and number of breaths per exhale. This will vary depending on pace, effort level, gradient, terrain, current fitness, state of mind. It is important not to force a specific count as this could induce hyperventilation. Remember as discussed above that we should be breathing to match our metabolic needs. Mindfulness has garnered lots of attention of the passed few years with more and more studies highlighting the benefits of a mindful practice. 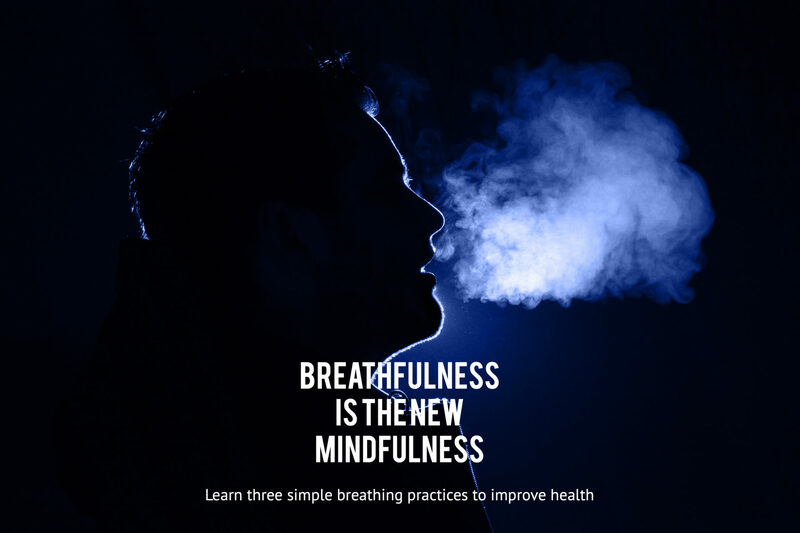 Breath is quite literally at the heart of mindfulness and it doesn’t take much for you to spend some time each day paying attention to your breath. It’s time now time to take up the practice of breathfulness. Share you passion and build a business The Chi Running Instructor Training Programme will give you the tools to deliver a simple but effective training method to help your clients improve their running technique. Check out our Teach It page or register below to receive more information. The programme includes a comprehensive online training course and a 4-day practical workshop.